Advance Tabco PRSCD-19-12 Prestige Series Enclosed Stainless Steel Drainboard Cabinet with Doors - 12" x 25"
This Advance Tabco PRSCD-19-12 Prestige series enclosed stainless steel drainboard cabinet is part of a complete lineup of upscale underbar equipment. Items found within the Prestige series of underbar equipment line up perfectly with each other, creating a uniform look across any bar. In addition to a number of eye-catching features, this item boasts an extended 7" backsplash, a removable perforated drainboard, and a 1" IPS drain to create a truly one-of-a-kind unit. 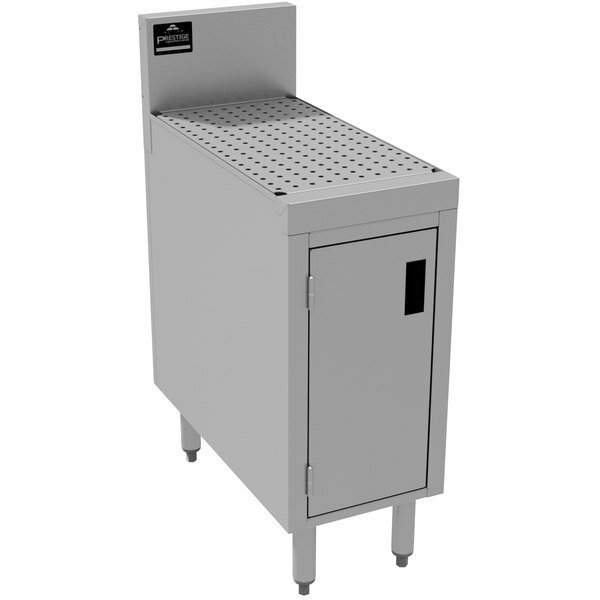 Made with 20 gauge, 300 series stainless steel, this unit's enclosed base is perfect for storing glassware for easy access. The lift-off hinged doors ensure accessibility while limiting any kind of contamination of your clean glassware. Plus, the entire unit is sound deadened so that you can use it during peak business hours without worrying about extra noise. This unit also features 18 gauge stainless steel legs to provide steady support and adjustable stainless steel bullet feet to account for any unevenness in the floor. Advance Tabco PRHS-19-18 Prestige Series Stainless Steel Underbar Hand Sink - 20" x 18"
Advance Tabco PRHS-24-18 Prestige Series Stainless Steel Underbar Hand Sink - 25" x 18"
Advance Tabco PRHS-19-12 Prestige Series Stainless Steel Underbar Hand Sink - 20" x 12"
Advance Tabco PRHS-24-12 Prestige Series Stainless Steel Underbar Hand Sink - 25" x 12"
Advance Tabco PRB-19-53L 3 Compartment Prestige Series Underbar Sink with (1) 23" Drainboard and Splash Mount Faucet - 20" x 60"
Advance Tabco PRB-24-31C 1 Compartment Prestige Series Underbar Sink with (2) 12" Drainboards and Deck Mount Faucet - 25" x 36"
Advance Tabco PRHSC-19-18 Prestige Series Stainless Steel Underbar Hand Sink with Cabinet Base - 20" x 18"
Advance Tabco PRB-19-43L 3 Compartment Prestige Series Underbar Sink with (1) 11" Drainboard and Splash Mount Faucet - 20" x 48"
Advance Tabco PRB-19-32L 2 Compartment Prestige Series Underbar Sink with (1) 11" Drainboard and Splash Mount Faucet - 20" x 36"
Advance Tabco PRB-24-32L 2 Compartment Prestige Series Underbar Sink with (1) 11" Drainboard and Deck Mount Faucet - 25" x 36"
Advance Tabco PRHSC-19-12 Prestige Series Stainless Steel Underbar Hand Sink with Cabinet Base - 20" x 12"
Advance Tabco PRHSC-24-12 Prestige Series Stainless Steel Underbar Hand Sink with Cabinet Base - 25" x 12"
Advance Tabco PRB-19-42R 2 Compartment Prestige Series Underbar Sink with (1) 23" Drainboard and Splash Mount Faucet - 20" x 48"
Advance Tabco PRB-19-53R 3 Compartment Prestige Series Underbar Sink with (1) 23" Drainboard and Splash Mount Faucet - 20" x 60"
Advance Tabco PRB-19-31C 1 Compartment Prestige Series Underbar Sink with (2) 12" Drainboards and Splash Mount Faucet - 20" x 36"
Advance Tabco PRB-19-64C 4 Compartment Prestige Series Underbar Sink with (2) 12" Drainboards and (2) Splash Mount Faucets - 20" x 72"
Advance Tabco PRB-19-43R 3 Compartment Prestige Series Underbar Sink with (1) 11" Drainboard and Splash Mount Faucet - 20" x 48"
Advance Tabco PRB-19-53C 3 Compartment Prestige Series Underbar Sink with (2) 12" Drainboards and Splash Mount Faucet - 20" x 60"
Advance Tabco PRB-19-63C 3 Compartment Prestige Series Underbar Sink with (2) 18" Drainboards and Splash Mount Faucet - 20" x 72"
Advance Tabco PRHSST-19-12 Prestige Series Stainless Steel Underbar Hand Sink with Soap and Towel Dispenser - 20" x 12"
Advance Tabco PRB-19-42L 2 Compartment Prestige Series Underbar Sink with (1) 23" Drainboard and Splash Mount Faucet - 20" x 48"
Advance Tabco PRHSST-19-18 Prestige Series Stainless Steel Underbar Hand Sink with Soap and Towel Dispenser - 20" x 18"
Advance Tabco PRB-19-74C 4 Compartment Prestige Series Underbar Sink with (2) 18" Drainboards and (2) Splash Mount Faucets - 20" x 84"
Advance Tabco PRB-19-83C 3 Compartment Prestige Series Underbar Sink with (2) 30" Drainboards and Splash Mount Faucet - 20" x 96"
Advance Tabco PRB-24-22C 2 Compartment Prestige Series Underbar Sink with Deck Mount Faucet - 25" x 24"
Advance Tabco PRHSST-24-18 Prestige Series Stainless Steel Underbar Hand Sink with Soap and Towel Dispenser - 25" x 18"
Advance Tabco PRB-19-44C 4 Compartment Prestige Series Underbar Sink with (2) Splash Mount Faucets - 20" x 48"
Advance Tabco PRB-19-73C 3 Compartment Prestige Series Underbar Sink with (2) 24" Drainboards and Splash Mount Faucet - 20" x 84"
Advance Tabco PRB-19-84C 4 Compartment Prestige Series Underbar Sink with (2) 24" Drainboards and (2) Splash Mount Faucets - 20" x 96"
Advance Tabco PRB-19-22C 2 Compartment Prestige Series Underbar Sink with Splash Mount Faucet - 20" x 24"
Advance Tabco PRB-24-32R 2 Compartment Prestige Series Underbar Sink with (1) 11" Drainboard and Deck Mount Faucet - 25" x 36"
Advance Tabco PRHSST-24-12 Prestige Series Stainless Steel Underbar Hand Sink with Soap and Towel Dispenser - 25" x 12"
Advance Tabco PRB-19-33C 3 Compartment Prestige Series Underbar Sink with Splash Mount Faucet - 20" x 36"
Advance Tabco PRB-19-32R 2 Compartment Prestige Series Underbar Sink with (1) 11" Drainboard and Splash Mount Faucet - 20" x 36"
Advance Tabco PRHSC-24-18 Prestige Series Stainless Steel Underbar Hand Sink with Cabinet Base - 25" x 18"
Advance Tabco PRB-19-42C 2 Compartment Prestige Series Underbar Sink with (2) 12" Drainboards and Splash Mount Faucet - 20" x 48"
Advance Tabco PRB-24-53L 3 Compartment Prestige Series Underbar Sink with (1) 23" Drainboard and Deck Mount Faucet - 25" x 60"
Advance Tabco PRI-19-36-XD Prestige Series Stainless Steel Underbar Ice Bin - 20" x 36"
Advance Tabco PRB-24-74C 4 Compartment Prestige Series Underbar Sink with (2) 18" Drainboards and (2) Deck Mount Faucets - 25" x 84"
Advance Tabco PRI-19-36-10 Prestige Series Stainless Steel Underbar Ice Bin with 10-Circuit Cold Plate - 20" x 36"
Advance Tabco PRB-24-84C 4 Compartment Prestige Series Underbar Sink with (2) 24" Drainboards and (2) Deck Mount Faucets - 25" x 96"
Advance Tabco PRB-24-53C 3 Compartment Prestige Series Underbar Sink with (2) 12" Drainboards and Deck Mount Faucet - 25" x 60"
Advance Tabco PRI-19-24-10 Prestige Series Stainless Steel Underbar Ice Bin with 10-Circuit Cold Plate - 20" x 24"
Advance Tabco PRI-19-24-10-XD Prestige Series Stainless Steel Underbar Ice Bin with 10-Circuit Cold Plate - 20" x 24"
Advance Tabco PRB-24-83C 3 Compartment Prestige Series Underbar Sink with (2) 30" Drainboards and Deck Mount Faucet - 25" x 96"
Advance Tabco PRB-24-73C 3 Compartment Prestige Series Underbar Sink with (2) 24" Drainboards and Deck Mount Faucet - 25" x 84"
Advance Tabco PRI-19-12 Prestige Series Stainless Steel Underbar Ice Bin - 20" x 12"
Advance Tabco PRB-24-64C 4 Compartment Prestige Series Underbar Sink with (2) 12" Drainboards and (2) Deck Mount Faucets - 25" x 72"
Advance Tabco PRI-19-24-XD Prestige Series Stainless Steel Underbar Ice Bin - 20" x 24"
Advance Tabco PRI-19-36 Prestige Series Stainless Steel Underbar Ice Bin - 20" x 36"
Advance Tabco PRI-19-30-10 Prestige Series Stainless Steel Underbar Ice Bin with 10-Circuit Cold Plate - 20" x 30"
Advance Tabco PRI-19-48 Prestige Series Stainless Steel Underbar Ice Bin - 20" x 48"
Advance Tabco PRI-19-42 Prestige Series Stainless Steel Underbar Ice Bin - 20" x 42"
Advance Tabco PRB-24-43L 3 Compartment Prestige Series Underbar Sink with (1) 11" Drainboard and Deck Mount Faucet - 25" x 48"
Advance Tabco PRI-19-30 Prestige Series Stainless Steel Underbar Ice Bin - 20" x 30"
Advance Tabco PRB-24-42L 2 Compartment Prestige Series Underbar Sink with (1) 23" Drainboard and Deck Mount Faucet - 25" x 48"
Advance Tabco PRI-19-24 Prestige Series Stainless Steel Underbar Ice Bin - 20" x 24"
Advance Tabco PRB-24-42R 2 Compartment Prestige Series Underbar Sink with (1) 23" Drainboard and Deck Mount Faucet - 25" x 48"
Advance Tabco PRI-19-42-10 Prestige Series Stainless Steel Underbar Ice Bin with 10-Circuit Cold Plate - 20" x 42"
Advance Tabco PRB-24-63C 3 Compartment Prestige Series Underbar Sink with (2) 18" Drainboards and Deck Mount Faucet - 25" x 72"
Advance Tabco PRB-24-33C 3 Compartment Prestige Series Underbar Sink with Deck Mount Faucet - 25" x 36"
Advance Tabco PRI-19-48-10 Prestige Series Stainless Steel Underbar Ice Bin with 10-Circuit Cold Plate - 20" x 48"
Advance Tabco PRB-24-53R 3 Compartment Prestige Series Underbar Sink with (1) 23" Drainboard and Deck Mount Faucet - 25" x 60"
Advance Tabco PRB-24-42C 2 Compartment Prestige Series Underbar Sink with (2) 12" Drainboards and Deck Mount Faucet - 25" x 48"
Advance Tabco PRB-24-44C 4 Compartment Prestige Series Underbar Sink with (2) Deck Mount Faucets - 25" x 48"
Advance Tabco PRI-19-30-XD Prestige Series Stainless Steel Underbar Ice Bin - 20" x 30"
Advance Tabco PRI-19-30-10-XD Prestige Series Stainless Steel Underbar Ice Bin with 10-Circuit Cold Plate - 20" x 30"
Advance Tabco PRI-19-36-10-XD Prestige Series Stainless Steel Underbar Ice Bin with 10-Circuit Cold Plate - 20" x 36"
Advance Tabco PRB-24-43R 3 Compartment Prestige Series Underbar Sink with (1) 11" Drainboard and Deck Mount Faucet - 25" x 48"
Advance Tabco PRI-24-24-10-XD Prestige Series Stainless Steel Underbar Ice Bin with 10-Circuit Cold Plate - 25" x 24"
Advance Tabco PRI-24-36 Prestige Series Stainless Steel Underbar Ice Bin - 25" x 36"
Advance Tabco PRI-24-36-10-XD Prestige Series Stainless Steel Underbar Ice Bin with 10-Circuit Cold Plate - 25" x 36"
Advance Tabco PRI-24-24 Prestige Series Stainless Steel Underbar Ice Bin - 25" x 24"
Advance Tabco PRI-24-36-XD Prestige Series Stainless Steel Underbar Ice Bin - 25" x 36"
Advance Tabco PRI-24-30-10-XD Prestige Series Stainless Steel Underbar Ice Bin with 10-Circuit Cold Plate - 25" x 30"
Advance Tabco PRI-24-30-10 Prestige Series Stainless Steel Underbar Ice Bin with 10-Circuit Cold Plate - 25" x 30"
Advance Tabco PRI-24-30 Prestige Series Stainless Steel Underbar Ice Bin - 25" x 30"
Advance Tabco PRI-24-30-XD Prestige Series Stainless Steel Underbar Ice Bin - 25" x 30"
Advance Tabco PRI-24-42 Prestige Series Stainless Steel Underbar Ice Bin - 25" x 42"
Advance Tabco PRI-24-48-10 Prestige Series Stainless Steel Underbar Ice Bin with 10-Circuit Cold Plate - 25" x 48"
Advance Tabco PRI-24-42-10 Prestige Series Stainless Steel Underbar Ice Bin with 10-Circuit Cold Plate - 25" x 42"
Advance Tabco PRI-24-12 Prestige Series Stainless Steel Underbar Ice Bin - 25" x 12"
Advance Tabco PRI-24-24-XD Prestige Series Stainless Steel Underbar Ice Bin - 25" x 24"
Advance Tabco PRI-24-48 Prestige Series Stainless Steel Underbar Ice Bin - 25" x 48"
Advance Tabco PRI-24-24-10 Prestige Series Stainless Steel Underbar Ice Bin with 10-Circuit Cold Plate - 25" x 24"